Our trade has closed after a strong US Dollar corrective rally and reversion from risk, kicked off in the morning European trading session. The pair has dropped back below the .9000 handle, taking us to our stop out point. The Aussie has done nothing but go up since the markets opened up yesterday, and now with the US session wrapping up soon, the pair is taking a breather after testing the .9100 handle. We will lock in more profits and ride out this trade by moving our stop from .8895 to .9000. No set profit target. The move higher is probably on speculation the RBA will raise interest rates by 25 bps to 7.00% this week. So, we may see a sell off on profit taking on the announcement, especially if the decision is inline or lower than consensus. This may prove to be a buying opportunity for longer term traders as I think the pair will continue higher as Australia’s economy continues to remain strong and consumer prices continue to rise. We will have to wait and see. For those who are currently in the run, don’t forget that adding to winners can be a great technique to enhance profits and worth the risk. Stay tuned for updates! AUD/USD is testing the .9000 handle once again and with US Non-Farm Payrolls right around the corner, we will adjust our stop to lock in further profits. Adjust stop on remaining position to .8895. I moved our stop to .8895 instead of .8905 just in case we saw strong buying support at .8900 if the pair move back down that low. For those who are a little more prudent, taking a bit of your position off at these levels (above .9000) would be wise. If the pair falls you can always renter back at probably a better price. Stay tuned for more trade updates and please be very cautious when trading around today’s US Jobs data. Prices can move very fast resulting in whipsaws and slippage on trade executions. Remember that limit order execution doesn’t guarantee a price, it just means you get the next best available market price and during this report, prices can move very, very fast. Be careful and good luck! Another volatile day in the currency markets as we saw the FOMC cut overnight interest rates down to 3.00%. We saw the Aussie whipsaw up and down after the event and now it is currently trading just below .8900. We will make another stop adjustment IF the pair rallies further. Weak US Dollar should continue to play out, especially since commodities and gold may continue to rally on Greenback weakness. We still have US Jobs data to close out the week, so volatility may remain high. Stay tuned for further updates and adjustments. Good luck my friends! Everything just seems to be going the Aussie’s way with gold and commodity prices continuing to push higher as well as weak US Dollar sentiment on the most recent weak housing data. The pair is now currently treading just below .8900 and I think its time to lock in more profits once again. I have a feeling .8900 may be the ceiling in the short term, so we will continue to watch closely especially at the .8850 price area. Stay tuned for more updates and adjustments! We saw further risk appetites growing today, along with surging gold, push up the Aussie above .8800. Weak US Existing Homes Sales were no help for the Greenback as they came in below expectations. Let’s make a few adjustments to lock in more profits. Adjust stop on remaining position to .8755. We will continue to trail stop by 100 pips. There’s still talk of the RBA raising rates in Australia, so there’s still plenty of sentiment to be bullish the Australian Dollar. We will continue to keep an eye on our position. Stay tuned! AUD/USD found support at .8700 during the morning European trading session with enough buyers to push it up to .8750 and beyond. We will adjust our stop to lock in more profits. A quick trading technique lesson: Scaling into winners. For those in for the longer haul, .8750 – .8800 may be a good area to add on to your position in small increments. For example, if your total position size is 100k, you could possibly add another 10k with the same stop. Because you have already locked in profits, if your position is stopped out, the loss on the new 10k is minuscule in relation to the gains of the larger position. If the position does go your way, you are just enhancing your overall profit. Hope this helps! The Aussie fell all the way down to .8520 and found support at the start of the European trading session. Our position was entered at .8555 on this fall and luckily, buyers jumped in and pushed the pair to .8600. Then we saw the surprise inter meeting rate cut from the FOMC to bring interest rates down to 3.5% in the US. Of course, AUD/USD popped even higher as traders sold Greenbacks and our first profit target was hit at .8655. We will continue to hold onto this position, collect some interest, and adjust stops if the trade continues to go our way. Stay tuned my friends! Hello Everyone! What a sell off we have seen in the high-yielding currencies pairs and carry trades. I think it may be a bit overdone at the moment and we may see support at .8500 – .8550. 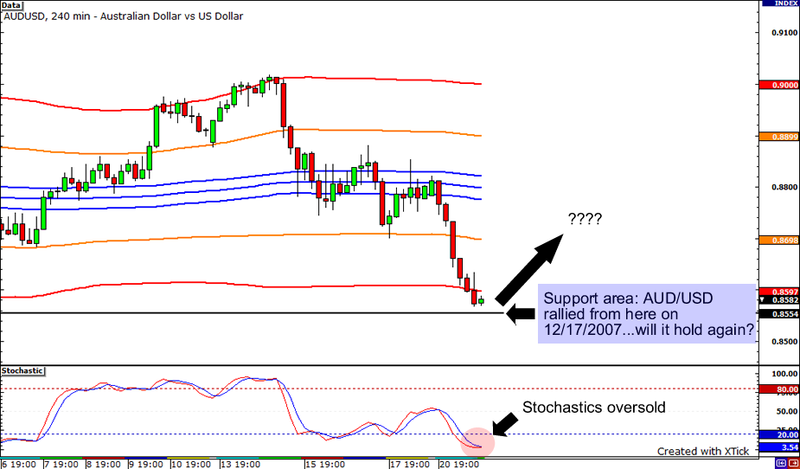 On the chart, I have drawn a price level where the pair found support and rallied back on 12/17/2007. Also, stochastics are indicating the pair may be oversold as it the indicator is currently reading below 20 and the pair is currently trading around the outer Bollinger bands. So, technically, the Aussie may be due for a reversal, possibly back to .8800. Fundamentally, we’ve seen selloffs in higher risk assets, including carry trades, on risk aversion. Again, I feel this sentiment may be overdone and I think buyers will get ready to jump back into the Aussie. There is speculation that the RBA may have to hike rates as Australia’s yearly inflation reads at 3.3% – outside of the targeted comfort zone of 2% – 3%. For the US, traders are speculating a 50 bps cut from the Fed, and there’s even talk of the Fed taking overnight interest rates down to 3% by the summer. So, with a potential growing interest rate differential between the US and Australia in the works, the AUD/USD is looking a bit more appealing. So, I am looking to buy AUD/USD at the support level drawn on the chart. Stay tuned for adjustments and updates…good luck my friends!